Offers a boost to Intel's entry-level chips. 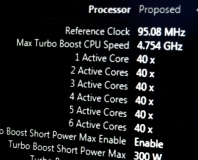 Intel has revealed how best to overclock a Sandy Bridge E PC. We tested Intel's latest Clarkdale CPU and found some interesting results about its memory performance. 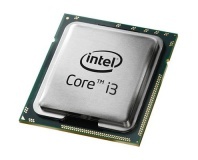 Does Core i3 and Core i5 have a problem? Have we really moved on from Core 2's front side bus model? We look at the tweaks and tradeoffs the design makes. We flew to Hong Kong to check out the Advanced Overclocking Championships 2008. With forty of the world's top overclockers in attendance, a vast supply of hardware to tear through and more liquid nitrogen on hand than there was on the set of Terminator 2 (maybe), we report on the action! ZDNet Germany has released a software-based overclocker for Mac Pro and Xserve systems, allowing for free performance gains for MacOS users. Memory manufacturer Corsair has beaten all rivals to claim the biggest overclock for a DDR3 module yet, using its Dominator DDR3 RAM to achieve a frequency of 2462MHz. Will you be overclocking a P45 mobo? READ THIS! We've got some important information you should read if you're thinking about buying a P45 motherboard and overclocking it. When your name is Intel and you're already winning the performance race, why stop there? The QX9770 has faster... everything. 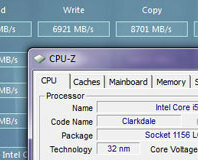 It uses an updated 1,600MHz front side bus, four 3.2GHz cores, a total of 12MB of L2 cache and it's a 45nm monster! Intel is to keep their lowest Core 2 CPU, the E2140 a little longer and further drop the price! Bargain of the year? Quite possibly. Asus P5K3 Delxue WiFi AP is the DDR3 version of the P5K Deluxe with an updated heatpipe array and support for DDR3 1333MHz FSB. Is the new memory technology worth investing in? We take an in depth look at DDR3 to try to find out. IDF SPRING 2007: Hate the fact new motherboards are great until you turn them on, only to find they have a really poor BIOS? So do we and UEFI is set to change exactly that. IDF SPRING 2007: We see a little better about how Intel works in China, detailing the investment made on Fab 68.